If you are going forward through the hop you arrived here from Natasha Zandbergen’ blog Inking Out of the Box. Isn’t it fun seeing all of the take out boxes? I know I’m getting some GREAT ideas! The other special thing about our Saturday Blog Hop is that each of us will be using the same item for our favor and this week we are all using the cool new Takeout boxes! This week we featured Halloween, Fall, Thanksgiving card sets. I LOVE the new Four Feathers set so I used it along with the All is Calm dsp and for this the Merry Everything stamp set. I randomly stamped the small leaf on the takeout box using Baked Brown Sugar. The belly band is 1 1/2″ wide and has an extra piece along the bottom as 12″ was not long enough. The one tag is made from Lost Lagoon and the Scallop Tag Topper and the other is the Note Tag Punch. The leaves were done in pear Pizzazz, Lost Lagoon and the the last one was gold embossed on kraft. Finally I add things finishing it off for the new Basic Gold Button and Linen thread. SOOO AWESOME!!! Next it is time to head on over to Melissa Davies at Rubberfunatics! 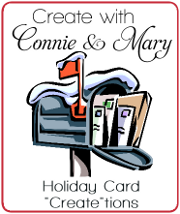 This entry was posted in 3D, Create with Connie and Mary, Holiday Mini and tagged Four Feathers, Merry Everything. Bookmark the permalink. 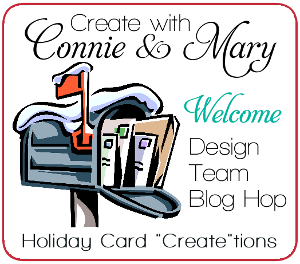 I have been using the feathers die & stamp set and I’m so in love with both products. Love what you did with your box! Mary, what a cute box! I love the tags mixed with the feathers and the colors look so good with the kraft box!! You KNOW the feathers are my fave!! Love it! Love the feathers! They look so great stamped on the box! And the belly band is a great way to accent it! Awesome tag! I think your box turned out GORGEOUS! I love the feathers so much, they make a beautiful embellishment!